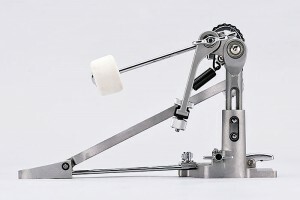 I’ve noticed the chatter on some drum forums that many people seem to have got excited about this new bass drum pedal. At first glance, this may seem a bit of an odd design. That said though, this isn’t actually a new design for Tama, or indeed in general, as the upward facing spring housing design dates back to [at least] the 1960s with the Rogers Swivomatic pedal. To look at, the Classic pedal may seem quite basic; maybe a lack of features and a plain footplate. However, despite what may seem to be a simplistic design, there is a lot more to this pedal. 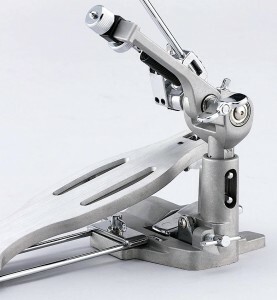 The most obvious thing about this pedal is the placement of the spring assembly which makes it very easy to adjust the tension of the spring, so much so you can do it still sat at the kit. In addition to this adjustment, you can change the pull of the chain by simply removing the cover [over the top of it] and moving it along the grooves. You also get to adjust the angle of the beater as well. Tightening the pedal to the hoop is again easy, as this is done from the side of the shaft rather than the more common under the footplate. Even adjusting the height of the post can be done without leaving your seat. Add to all that, there are marks on the pedal which help you remember what your preferred settings are. 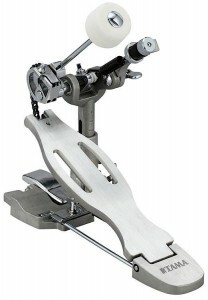 I have to admit, when I first saw this pedal, I thought it was ugly. I have an old no-name pedal with a similar design which I inherited somehow and I’ve never liked the look of it. It’s the spring assembly; it just looks out of place to me. But, after I understood the design of the pedal – and that to accommodate the adjustable post height, it couldn’t really be any other way – I got over my silly little prejudice. In summary, this is a pretty useful pedal all round. The main thing, for me anyway, is the ability to raise or lower the post/beater assembly to accommodate different bass drum sizes. This gets rid of the need to have a riser/lifter and therefore you’ll always have the beater hitting the centre of the drum and not have to worry about the riser coming lose or wobbling. This is great because I never really much cared for using risers. The hard felt beater – how very ‘classic’ – delivers a good solid punch too. The Classic pedal isn’t going to win the hearts of any speed metal players, but it is lightweight, quick and comfortable all the same. It doesn’t particularly feel like a single chain design – to me anyway, which I often find to be noticeably lighter in feel – but it still feels solid. It also folds down for transport pretty well too. Finally, cost. This pedal is really quite reasonably priced, especially with all the features it has, which to be honest are quite a lot more than some of the much more expensive pedals I own. Winner. Having now spent some time with it, I understand why people have been raving about this pedal.